Friday night was the 2nd anniversary of the Santa Monica Critical Mass ride and the Green Party opened up its doors to us for an after-party yet again. I missed the ride cause I was preparing my music to be laptop DJ (which ruled). The party was fun, we raffled off a bunch of great prizes, etc, etc. About a dozen of us left at 130am, heading across town. Budge was super drunk, which was funny when he was kicking mirrors on Porsches, but less funny when he was falling on the ground. I road Molly over to Echo Park and took a long way back so it was almost 4am when I arrived back home. This is part of my sleep deprivation training. I read for a couple of hours and made food then went on a 32-mile road ride at dawn. What was most odd was that I felt cold the whole time, but I knew that it was not that cold out. Afterwards, sans spandex, I rolled over to Janie’s for her cupcake r ide. 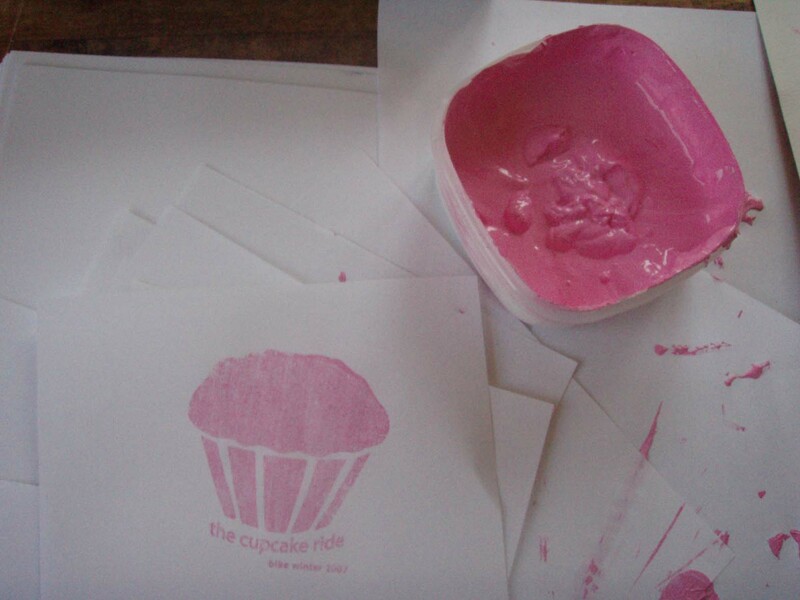 I brought a bright pink shirt to have a pink cupcake screened on. They rode to some bougie place in Beverly Hills that doesn’t have any vegan options (and were pissy when asked). So instead I rolled by the house to scoop up Jack, Megan, Morgan and Budge to meet the main group at Mannie’s for some breakfast and vegan sweets. I ended up catching a 3-hour nap around 3pm, before heading out for the night. Including the commute miles, I rode almost 100 miles in the 33 hours I was awake plus I had run for an hour and a half early Friday morning. Sunday Stephen and I did Tony’s gravity race and then did a moderately paced 40 miles through Griffith Park and then up Chevy Chase and back.